Bronchitis is a respiratory disease that causes inflammation in the airways, also known as bronchi, of the lungs. It leads to irritation and inflammation of the lining of bronchial tubes, which are responsible for carrying air to and from the lungs. Shortness of breath, cough with thick mucus, chest discomfort, wheezing, fatigue, slight fever, and chills are common symptoms of bronchitis. Bronchitis can be either acute or chronic. Acute bronchitis, also known as chest cold, is a temporary inflammation of the bronchial tubes that leads to cough and mucus production and lasts for up to three weeks. On the other hand, chronic bronchitis is a type of chronic obstructive pulmonary disease (COPD), a long-term, serious condition, which leads to production of cough with thick mucus and lasts for up to three months. The global bronchitis treatment market was worth US$ 3,432.62 Mn in 2017. It is expected to expand at a CAGR of 3.6% from 2018 to 2026. Anti-inflammatory drugs, mucolytics, and bronchodilators are widely utilized for the treatment of bronchitis. Increase in morbidity and mortality associated with bronchitis across the globe is a major factor driving the global bronchitis market. However, stringent regulatory scenario and patent expiry of key drugs restrain the global market. The global bronchitis treatment market can be segmented based on type, drug class, distribution channel, and region. Furthermore, in terms of type, the market can be divided into chronic bronchitis and acute bronchitis. The chronic bronchitis segment is likely to account for a leading share of the global market during the forecast period, owing to high morbidity and mortality rate. Based on drug class, the bronchitis treatment market can be divided into antibiotics, anti-inflammatory drugs, bronchodilators, and mucolytics. In terms of distribution channel, the market can be classified into hospital pharmacies, retail pharmacies, and online pharmacies. The retail pharmacies segment held significant share of the market in 2017, due to a rise in the sale of over-the-counter bronchitis therapeutics. Based on region, the global bronchitis treatment market has been segmented into five major regions: North America, Europe, Asia Pacific, Latin America, and Middle East & Africa. North America and Europe accounted for a major share of the global market in 2017. High prevalence of bronchitis and presence of a large geriatric population that is more prone to develop bronchitis fuelled the demand for bronchitis therapeutics in these regions. The bronchitis treatment market in Asia Pacific is likely to expand at a high CAGR during the forecast period. Increase in incidence of bronchitis, adoption of western lifestyle, excessive cigarette smoking, and rise in health care expenditure are projected to fuel the market in the region during the forecast period. Latin America and Middle East & Africa are expected to present significant opportunities in the bronchitis market during the forecast period. Key players operating in the global bronchitis treatment market include AstraZeneca, Novartis AG, GlaxoSmithKline plc, Dr. Reddy's Laboratories Ltd., Melinta Therapeutics, Sanofi Aventis, and Boehringer Ingelheim International GmbH. These companies have established their stand in the market and enjoy brand loyalty among customers. They have a diverse product offering and an extensive distribution system across the world. Moreover, entry of small players, especially in the emerging markets of Asia, is being witnessed. However, stringent regulatory framework and high-quality standards set by market leaders are anticipated to restrain the penetration of new entrants in the market. The global bronchitis treatment market report comprises an elaborate executive summary, which includes a snapshot that provides information about various segments of the market. It also provides information and data analysis of the global market with respect to segments based on type, drug class, distribution channel, and region. A detailed qualitative analysis of drivers and restraints of the market and opportunities has been provided in the overview section. Additionally, the section comprises competitive matrix and company profiles with business overview to understand the competitive landscape in the market. This section of the report also provides market attractiveness analysis by region and market share analysis by key players, thereby presenting a thorough analysis of the overall competitive scenario in the global bronchitis treatment market. The global bronchitis treatment market has been segmented based on type, drug class, distribution channel, and region. Furthermore, in terms of type, the market has been divided into chronic bronchitis and acute bronchitis. The chronic bronchitis segment is likely to account for a leading share of the global market during the forecast period owing to high morbidity and mortality rate. Based on drug class, the bronchitis treatment market has been classified into antibiotics, anti-inflammatory drugs, bronchodilators, and mucolytics. In terms of distribution channel, the market has been segregated into hospital pharmacies, retail pharmacies, and online pharmacies. The retail pharmacies segment held a significant share of the market in 2017 due to a rise in the sale of over-the-counter bronchitis therapeutics. The market size and forecast for each of these segments have been provided for the period from 2016 to 2026, along with their respective CAGRs for the forecast period from 2018 to 2026, considering 2017 as the base year. 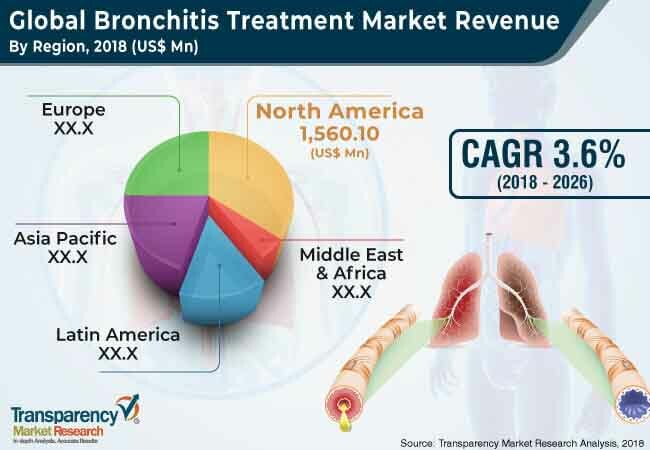 In terms of region, the global bronchitis treatment market has been segmented into five major regions and key countries/sub-regions: North America (the U.S. and Canada), Europe (the U.K., Germany, France, Spain, Italy, and Rest of Europe), Asia Pacific (India, China, Japan, Australia & New Zealand, and Rest of Asia Pacific), Latin America (Brazil, Mexico, and Rest of Latin America), and Middle East & Africa (South Africa, GCC Countries, and Rest of Middle East & Africa). The market size and forecast for each of these regions and countries/sub-regions have been provided for the period from 2016 to 2026, along with their respective CAGRs for the forecast period from 2018 to 2026, considering 2017 as the base year. The research study also covers the competitive scenario in these regions. The report also profiles major players in the global bronchitis treatment market based on various attributes such as company overview, financial overview, type portfolio, business strategies, and recent developments. Key players in the global bronchitis treatment market are AstraZeneca, Novartis AG, GlaxoSmithKline plc, Dr. Reddy's Laboratories Ltd., Melinta Therapeutics, Sanofi Aventis, and Boehringer Ingelheim International GmbH.